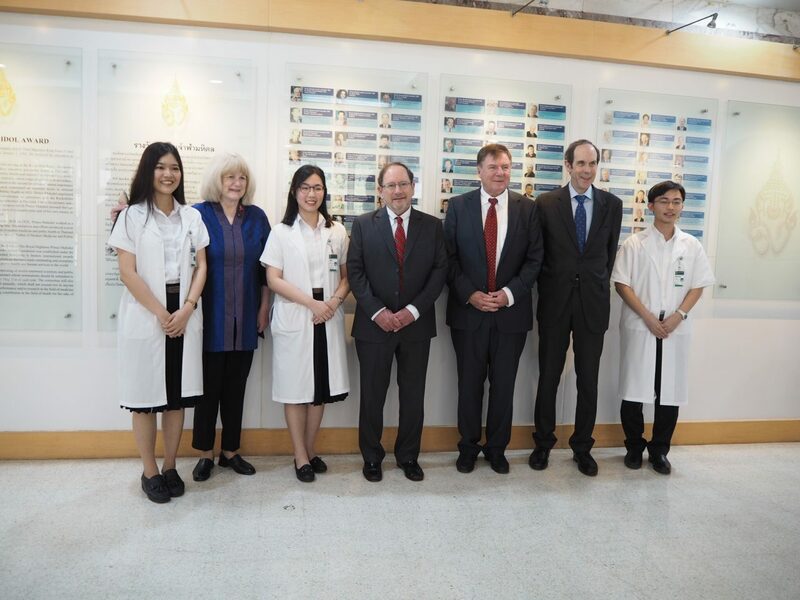 Today (January 30th, 2019) at 09:30 am, the Prince Mahidol Award Laureates 2018 namely Professor Brian J. Druker, M.D.and Professor Dr. Mary-Claire King (PMA in the field of Medicine) together with Professor John D. Clemens, M.D. and Professor Jan R. Holmgren, M.D., Ph.D. (PMA in the field of Public Health) arrived at the Faculty of Medicine Siriraj Hospital. The PMA2018 Laureates received a warm welcome from Professor Dr.Prasit Watanapa, the Vice Chairman of Prince Mahidol Award Foundation under the Royal Patronage and the Dean of Faculty of Medicine Siriraj Hospital, along with faculty executives. 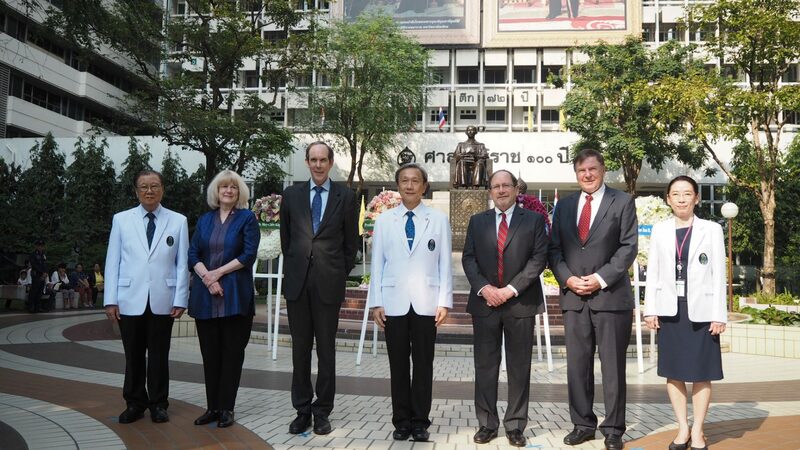 As a tradition, the PMA Laureates paid the official visit to the Faculty of Medicine Siriraj Hospital, the host and founder of Prince Mahidol Award (PMA), and delivered special lectures demonstrating their rewarded contributions to the world of medical sciences and public health. 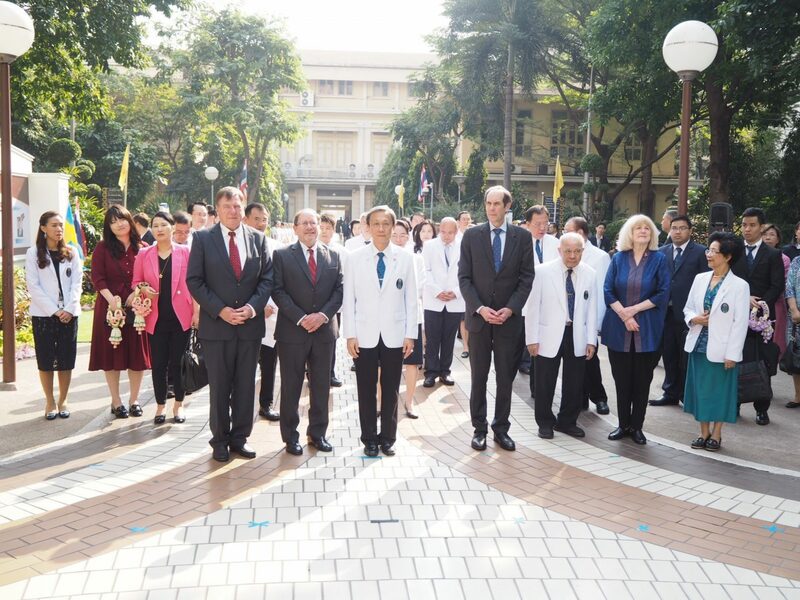 Upon arrival at the Faculty of Medicine Siriraj Hospital at 09:30 am, The Laureates paid respect to the status of Prince Mahidol and of Somdech Phra Srinagarindra Boromarajajonani. Then, the PMA2018 Laureates paid respect in front of the portrait and the Statue of His Majesty the late King Bhumibol Adulyadej, and then the Statue of His Majesty the King Chulalongkorn. At 09:45 am, the laureates were escorted to visit the Prince Mahidol Hall of Fame at Syamindhra Building, 2nd floor to appreciate the collection of Prince Mahidol’s rare personal possessions and his royal duty and his tremendous contributions to the modern medicine in Thailand. At 10:45 am, Professor Dr.Prasit Watanapa, the Dean of Faculty of Medicine Siriraj Hospital, delivered a welcoming remark and a brief introduction of PMA2018 Laureates in the Meet the Press at Chulabhorn Conference room, 2nd floor of Sayamindra Building. Thereafter, Professor Brian J. Druker, M.D., Professor Dr. Mary-Claire King (PMA in the field of Medicine), Professor John D. Clemens, M.D. 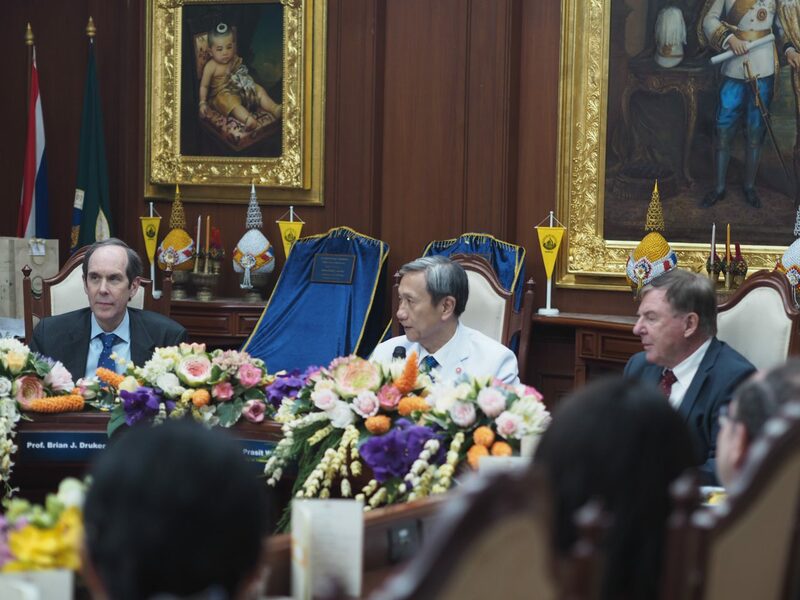 and Professor Jan R. Holmgren, M.D., Ph.D. (PMA in the field of Public Health) elaborated on their outstanding achievements which could be the exemplary contributions to the advancement of the medical and public health services in Thailand as well as to provide the great inspiration to the young generations. At 11:45 am, the Laureates attended the Faculty Luncheon hosted by the Faculty of Medicine Siriraj Hospital in honoring of their significant contribution and achievement at the Faculty Conference room, 2nd floor, Administration Building. At 01:30 pm, the Laureates granted the special lectures demonstrating their significant contributions for the benefits of humankind at the Rachapanaddasirindhorn Auditorium, G Floor of Sri Savarindira Building. The special lectures were started with the topics in the field of Medicine, “Anatomy of a Breakthrough in Targeted Cancer Treatments” given by Professor Brian J. Druker, followed by “From Gene Discovery to Precision Medicine and Public Health” given by Professor Dr. Mary-Claire King, and were closed with the topics in the field of Public Health “The Development of Effective Oral Cholera Vaccines (OCVs)” given by Prof Jan R. Holmgren and “Killed Oral Cholera Vaccines: The Long, Winding Road to Public Health Use and Impact” given by Professor John D. Clemens respectively. The special lectures were witnessed by the audiences including Siriraj medical students, residents, medical staffs, nurses and allied health personnel. The Prince Mahidol Award Foundation under the Royal Patronage of His Majesty the late King Bhumibol Adulyadej was established in commemoration of the centenary of the birth of His Royal Highness Prince Mahidol of Songkla, on January 1, 1992. The Foundation is under the Royal Patronage, with Her Royal Highness Princess Maha Chakri Sirindhorn as the president. 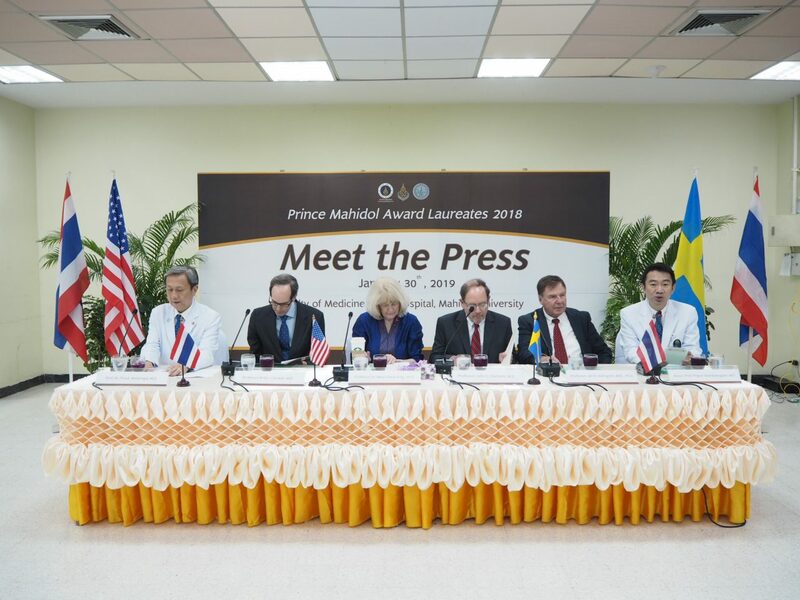 The Foundation annually confers two Prince Mahidol Awards upon the individual(s) or institution(s), which have demonstrated outstanding and exemplary contributions to the advancement of the world’s medical and public health services. 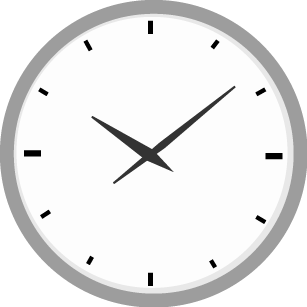 Each Award consists of a medal, a certificate and a sum of US $100,000. His Majesty the King of Thailand has graciously designated Her Royal Highness Princess Maha Chakri Sirindhorn to preside over the Ceremony of the Prince Mahidol Award 2018 at the Chakri Throne Hall, The Grand Palace on Thursday, January 31st, 2019 at 05:30 pm.